"Can Air Defense Save America? 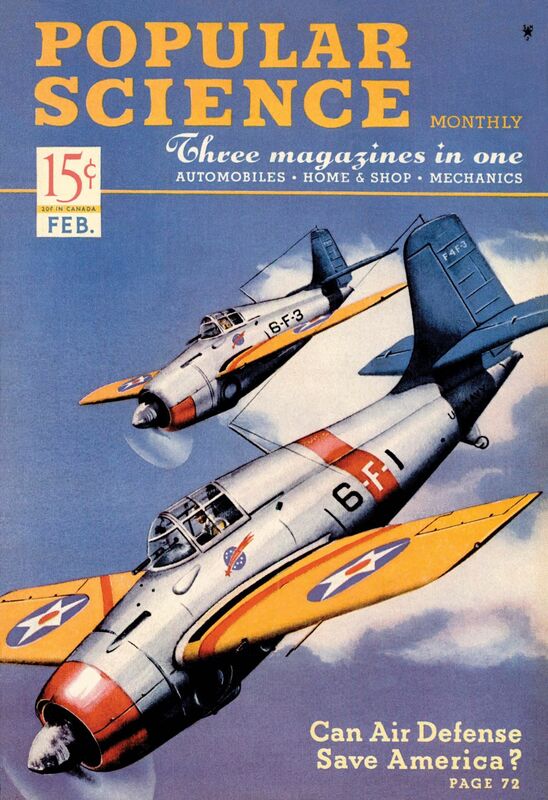 ", February 1941 issue of Popular Science. Shown are F4F-3 Wildcats. The accompanying article notes that Wildcats cost $30,000, could reach 37,500 feet in altitude, and had a top speed of 328 mph. Italian/Greek Campaign: The Greek forces consolidate their hold on the Trebeshinë massif on 3 February 1941. This area is considered the gateway to the key Italian port of Valona. The weather and continued Italian resistance, however, precludes further advances for the time being. East African Campaign: The Italians are well dug in at Keren, the key to the conquest of Eritrea for the British. They occupy the heights surrounding the town, including a spur rising 1800 meters (6000 feet) to the right of the road. Having occupied the area for years, the Italians have had plenty of time to select the most defensible positions. It is obvious from the local geography that Keren is the best point remaining to close the door on the British before they reach Asmara and the Eritrean highlands. The British troops begin arriving today at Keren. The 11th Indian Infantry Brigade of the 4th Indian Division, fresh off the victory at Mount Cochen, approaches the town's outskirts and prepares to reconnoiter the region. The Italians bide their time, knowing that, while the British might have the upper hand in a fluid battle, their fixed defenses will make them extremely difficult to dislodge. European Air Operations: RAF Bomber Command dispatches 113 planes to lay mines during the night. Otherwise, everything is quiet on both sides except for some scattered raids in Eastern England, including a few bombs dropped on London. "Supermarine Spitfire Mk Is of No. 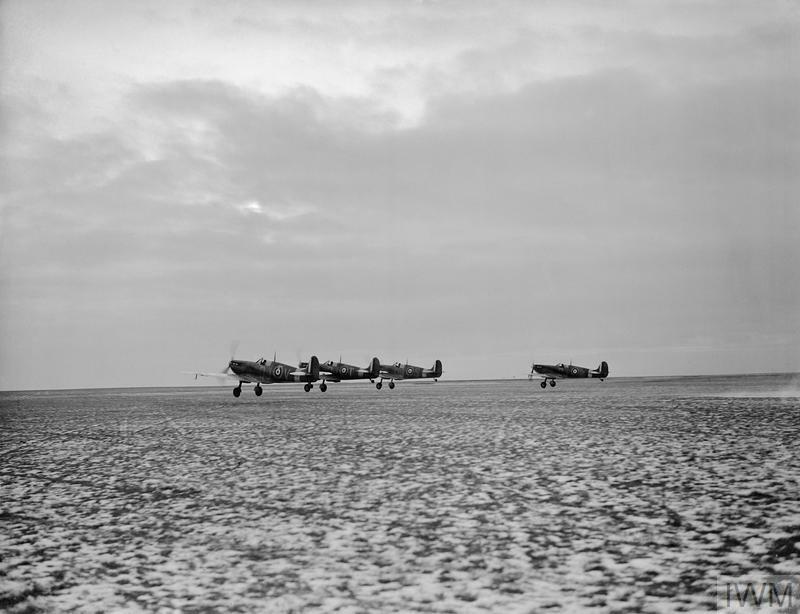 92 Squadron RAF taking off from Manston, Kent, February 1941." © IWM (CH 2537). Battle of the Atlantic: Having evaded the Royal Navy patrols and topped off their fuel tanks, German battlecruisers Scharnhorst and Gneisenau proceed through the Denmark Strait. Once through, they will menace the shipping lanes to the south. The Royal Navy has no idea where they are, and earlier reports by a British cruiser south of Iceland that it had sighted the German ships (which it did) have been dismissed as "illusions." U-107 (K.Kapt. Günther Hessler) stalks Convoy OB 279 in the North Atlantic shipping lanes. It torpedoes and sinks 4633 ton British refrigerated freighter Empire Citizen and 5051 ton Royal Navy ocean boarding vessel HMS Crispin (which remains afloat until the 4th). There are 78 deaths and 5 survivors of the Empire Citizen, and there are 19 deaths on the Crispin. The Luftwaffe bombs and sinks Royal Navy 352 ton minesweeping trawler HMT Arctic Trapper off of Ramsgate. There are 17 deaths. The Luftwaffe bombs and damages 2660 ton freighter Dione II in the shipping lanes northwest of Ireland. It loses power and falls behind its convoy, Convoy SC 20, making it easy prey for attackers. Royal Navy anti-submarine ship MA/SB-12 hits a mine off Milford Haven. It is taken in tow, but eventually sinks. British 212 ton freighter Calyx hits a mine and is damaged in the Mersey Estuary 8 miles from the Bar Light Vessel. It makes it to Liverpool. Royal Navy 89 ton drifter Midas is engaged in a collision and sinks off Dungeness. The Kriegsmarine lays defensive minefield Rugen off the Norwegian coast. Convoy OB 282 departs from Liverpool, Convoy FS 403 departs from Methil, Convoy AS 14 departs from Piraeus, Convoy ASF 14 departs from Piraeus, Convoy HX 107 departs from Halifax. Royal Navy corvettes HMS Abelia and Violet commissioned, minesweeper HMS Blackpool commissioned, minesweeping trawler HMS Flotta launched. Battle of the Mediterranean: Lieutenant John Combe of the 11th Hussars Regiment sets out at 07:00 to the south of Green Mountain (the Jebel Akhdar) with about 2000 men in wheeled vehicles. This is "Combe Force." The British 7th Armoured Division follows later in the day. The objective is to bypass Benghazi to the south via Msus and Antelat and close the Benghazi-Tripoli road. The Italians already are evacuating Benghazi, but Italian troops are still east of the city, being pursued by the Australian 6th Infantry Division. While Combe's troops face little opposition, the terrain is rougher than on the well-built coastal road. Italian 1130 ton freighter Multedo is lost around this date in the Gulf of Sirte of unknown causes. There is another victim of the Luftwaffe minelaying of the Suez Canal. This time, it is 4934 ton British freighter Derwenthall. The mine blows off the ship's rudder, but the Derwenthall makes it to Suez in tow. 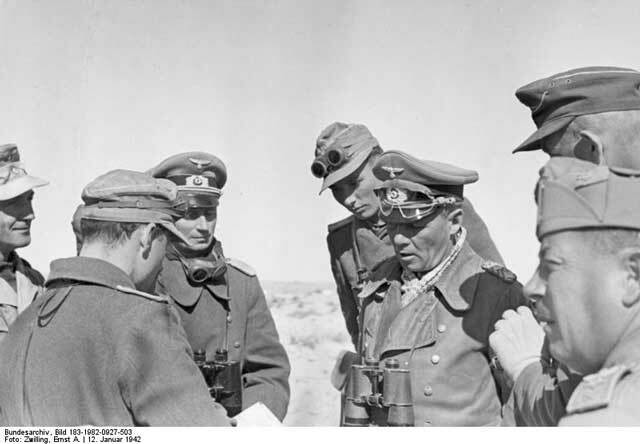 General Erwin Rommel is appointed to command "German Army Troops in Africa." There are as yet no German troops in Africa, but his command will evolve into the later Afrika Korps. Fry, Arizona in January 1941. Courtesy Arizona Historical Society/Tucson. Battle of the Pacific: A pair of US destroyers operating off Oahu, Hawaii make what they believe to be an underwater contact. It is unidentified, so USS Dale, Hull and Lamson spend time searching the area for intruders. They find nothing and eventually return to base. The Navy converts an old Navy airstrip located seven miles west of Pearl Harbor into Marine COrps Air Station Ewa. There are plans to develop the strip into a major airbase. Battleship USS Arizona makes port in Pearl Harbor. German Military: Field Marshal von Brauchitsch brings OKH Chief of the General Staff General Franz Halder up from Zossen to the Chancellery in Berlin. They are there to show the army's plans for Operation Barbarossa, the invasion of the Soviet Union, to Adolf Hitler. The intelligence service estimates that the Wehrmacht would be outnumbered both in divisions - the Soviets having 155, slightly more than the Germans - and armor - the Soviet tanks outnumbering German ones 10,000 to 3500. Halder further cautions that, while the Soviet armor is inferior, "Even so, surprises cannot be ruled out altogether." The numerical inferiority will suffice because of quality and surprise. Halder also warns that transferring the army to the East will make any operations in the West, such as Operation Attila (the occupation of Vichy France), essentially impossible. When Barbarossa commences the world will hold its breath and remain silent! While he approves the plan, which envisages three essentially equal thrusts in the north, center and south, Hitler clings to the belief that the main effort should be in the north, toward Leningrad, with the advance in the South toward Kiev taking secondary priority. He likes the idea of working together with the Finns, who he calls "a plucky people," and thus wants to join with them quickly. The general consensus in the army, however, is that the main effort should be in the center, toward Moscow. These conflicting viewpoints will not be resolved until the campaign actually starts and, some have argued, go a long way toward dooming the entire invasion. Separately, Field Marshal Fedor von Bock returns from medical leave. He re-assumes command of Army Group Center (technically, he commands Army Group B) in Poland. Von Bock is pessimistic about the prospects for forcing the Soviet Union to make peace, and is one of the few willing to question Hitler about it. However, Hitler has told von Bock that Germany has plenty of resources with which to handle the Soviets. 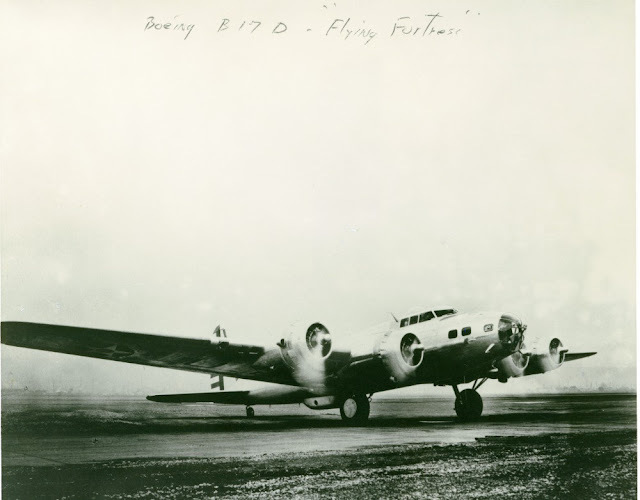 First B-17D, February 3, 1941 (San Diego Air & Space Museum Archives) by San Diego Air & Space Museum Archives (Flickr). US Military: Deputy Chief of Staff General Moore urges a formal codification of US defense objectives and army strength. At this point, the US Army is still nebulous, with only vague projections of millions of men being drafted. There is no planning at all being done as to how many divisions these men would form, or what kind of divisions (infantry, armored, cavalry etc.) they would be. Essentially, the army is "playing it by ear" at this point, with no concrete plans for how a mobilization would proceed. Soviet Military: A new military intelligence service is instituted separate from the NKVD. Called NKGB, it has Vsevolod Merkulov leading it as People's Commissar of State Security. Kliment Voroshilov receives his third Order of Lenin. He has been a member of the Central Committee since 1921, People's Commissar for Military and Navy Affairs since 1925, a member of the Politburo since 1926, People's Commissar for Defense since 1934, and a Marshal of the Soviet Union since 1935. US Government: Debate continues in Congress over the Lend Lease Bill. Passage in the Senate appears to be assured, but in the House is much less certain. The Administration is engaged in a full-scale effort to win passage of the Bill because Great Britain has run out of money to fund the war and from this point is going to have to rely upon US largesse one way or another. Further impression. Can these mandates [i.e., Israel] really work. There is here a problem of reconciling Jew and Arab, which will become active again after the war. We, the mandators, have all the odium of attempting settlement & direction without the real power of government.... [H]aving regard to the strategical position of Palestine we should have cut out sentimentality long ago and taken it over. Cuba: President Fulgencio Batista, who took office on 10 October 1940, begins tightening his grip on the country. At this point, Batista has the support of the local communists and implements progressive policies. China: In the continuing Battle of Southern Honan, the Japanese 11th Army takes possession of Tamshin, to the east of Canton. The Chinese 5th War Area, meanwhile, re-occupies Paoanchai and Wuyang. The Japanese have very efficient troops, but they do not have enough manpower to occupy the large swathes of China that it is capable of taking. This will forever curtail its successes in China. American Homefront: In United States v. Darby Lumber Co., 312 U.S. 100 (1941), the US Supreme Court upholds the Fair Labor Standards Act of 1938. This decisions establishes that the Commerce Clause of the US Constitution grants Congress the authority to regulate employment conditions within the several states. 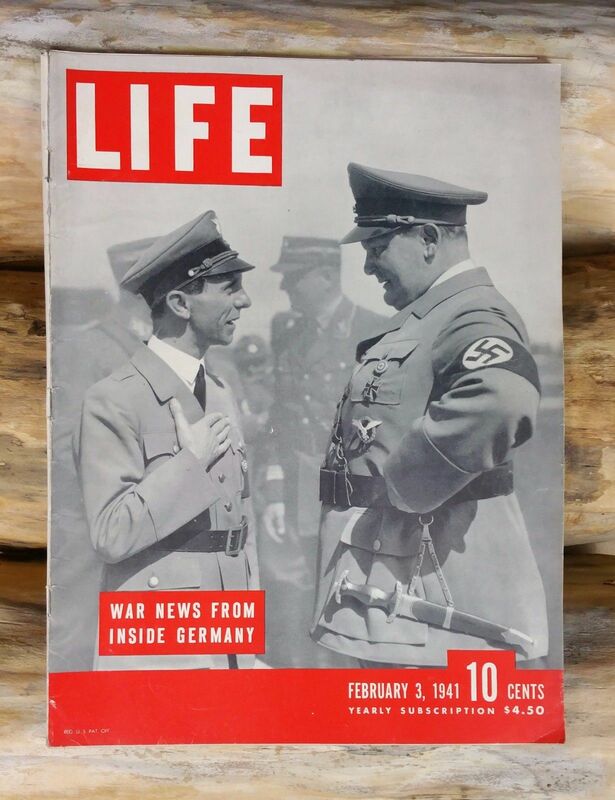 Life Magazine, "War News From Inside Germany," February 3, 1941.